I grew up in Australia and spend 5 years, in the early 1980’s, living in a remote mining town called Weipa, with only 800 other inhabitants (though the population boomed shortly after I arrived there). For a child there was no better lifestyle as we had complete freedom (well almost!). 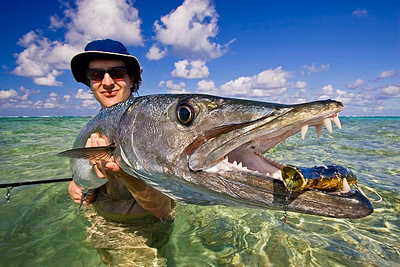 The ocean around the mining town was almost untouched and the fishing was great – in fact it was unbelievable. So, on a recent read through fishing sites ( probably to relive my youth ) I came upon Henry-Gilbey.com. I figure that fishermen, and fisherwomen, also need dehumidifiers for their wet gear, boats and sheds etc. At least that is my excuse for including Henry’s website as a Blog of the Month winner on byemould.com! Henry makes his way through life as a fishing writer, photographer, TV presenter and consultant. His website shows that he does the first two very admirably. His blog posts are long, detailed but not boring and his photography is truly awesome. One of my favourite posts on Henry’s blog is his review of the best fishing tackle for 2014 as it is a detailed, well written piece. In fact this post made me go to Amazon to see if my old rig was still in existance. After 30 years I didn’t expect it to be but this Daiwa reel would be an upgrade of the reel that I used all those years ago. Alas, my rods were Australian made and no longer in existance. Henry’s new fishing book. Click link for more information. Another aspect of Henry’s site I like is that there is a ‘Help and Info’ page which covers how to tie fishing knots, Fishing in Ireland and photography tips. In addition there is also a ‘Links’ page which every fisherman and photographer would love. Henry is easy to contact and if you are a fishing fanatic then you should really introduce yourself to him as he’s obviously knowledgable about all aspects of fishing. In fact, over the last few years I have only been jigging for Mackerel with my sons, but after reading Henry’s blog I am motivated to go after large fish with light tackle again. Look out Pike! I hope that you enjoy Henry’s blog as much as I have.